A more satisfying ending to one of the best television shows of all time. 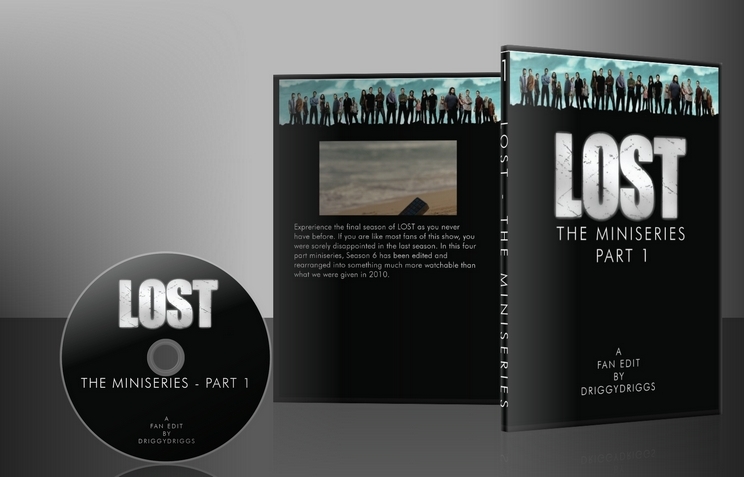 In this 4-Part fan edit of LOST’s final season, we discover what happens to the survivors of Oceanic 815 after they detonated the hydrogen bomb 30 years in the past in order to change the future. This fan edit ends with a much different outcome than the series did. 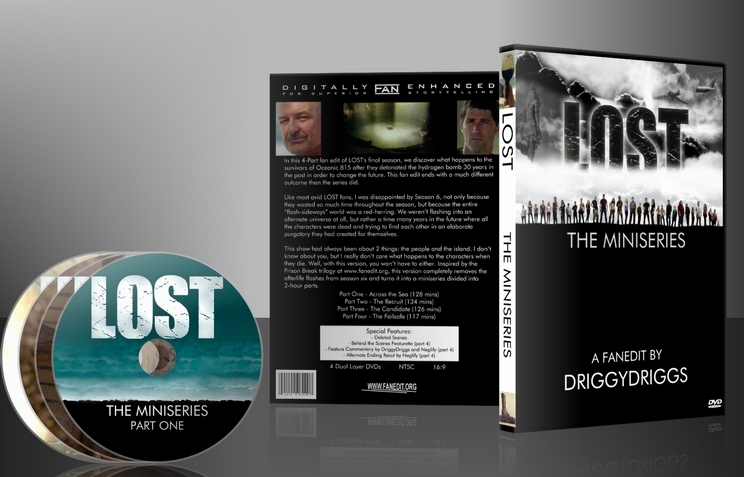 This miniseries is meant to be watched after the first five seasons of LOST. I wanted to give LOST fans like myself a better ending to the show. This is the final version of this edit. Like most avid LOST fans, I was disappointed by Season 6, not only because they wasted so much time throughout the season, but because the entire “flash-sideways” world was a red-herring. We weren’t flashing into an alternate universe at all, but rather a time many years in the future where all the characters were dead and trying to find each other in an elaborate purgatory they had created for themselves. This show had always been about 2 things: the people and the island. I don’t know about you, but I really don’t care what happens to the characters when they die. Well, with this version, you won’t have to either. Inspired by the Prison Break trilogy on the main site, this version completely removes the afterlife flashes from season six and turns it into a miniseries divided into 2-hour parts. A special thanks goes out to Neglify for previewing my workprints and giving his feedback. It is much appreciated! This one is a combination of the episodes "LAX" parts 1 and 2, "What Kate Does" and "Across the Sea" with no “flash-sideways”. Also, flashbacks tell the details of Jacob and the MiB’s past. A few other trims were made here and there, but the story mostly remains in tact for this part. Part 2 will have lots more cuts and re-arranging. - Added the scene from the Season 5 finale to the beginning with “Flocke” killing Jacob. The end of this scene then goes to a flashback of their mother arriving on the Island and giving birth to the twins. Then, to the LOST logo. - After the logo, we get a quick recap of the “Losties” dropping the bomb in the construction site, then we see what happened to them. - Using the episode, “Across the Sea,” flashbacks are inserted throughout this edit explaining Jacob and MiB’s past. The final scene of this part is Jacob laying his mother and brother to rest in the caves, thus explaining the two bodies in the caves with the stones. - Cut a scene of Jack and Kate sharing a moment before she goes to look for Sawyer. Mostly for pacing. - Cut Hurley and Miles over Sayid’s body saying goodbye. - Re-arranged some of the scenes so that the stuff with Ben and “Flocke” on the beach is spread out in this part. Rearranging some scenes also required the removal of some dialogue. - Cut out all of the spots where it went to black on the commercial breaks. - Added “A Fan Edit by DriggyDriggs” (my nick name) before the episode starts. - Added some credits where necessary due to cutting out the flash-sideways. - Added titles before the bomb recap, “Thirty Years Ago”. - Added Guest Star credits for the actors from “Across the Sea” and removed the Guest Stars that do not appear since the “flash-sideways” was removed. - Increased the size of the text in the Scene Selection menu for the DVD. - Removed episode opening for “What Kate Does” of The Interpreter running through the halls. - Added FanEdit.org animated logo to the end. This one is a combination of the episodes “The Substitute,” “Lighthouse,” “Sundown,” “Dr. Linus,” “Ab Aeterno,” and a few minutes of “Recon” with no “flash-sideways,” and a bunch of other silly or annoying things cut out. Also, flashbacks tell the details of Richard’s past. 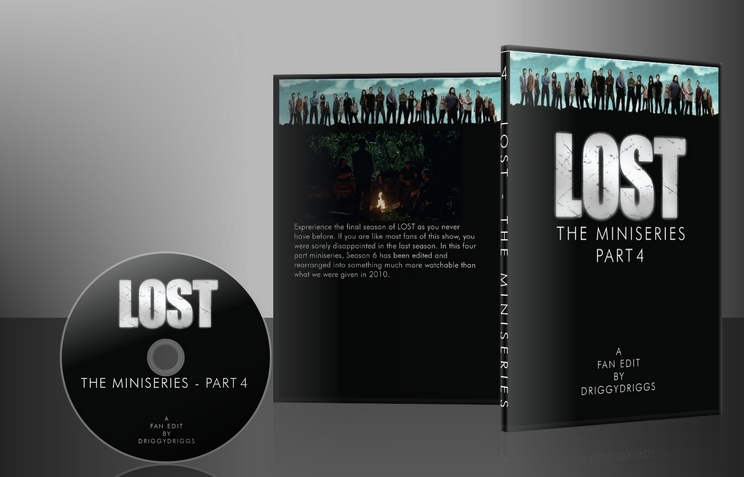 - Created a “Previously on Lost” segment. - Episode opens with Richard’s first flashback of riding to his house and talking with his sick wife, then flashes to the present with Smokey/Flocke flying across the island. He stops and cuts Richard down from the tree to talk, then to the LOST logo. - Rearranged some scenes from episodes 4 and 5 so that it doesn’t seem Sawyer-centric for so long, since the events are happening at the same time anyway. - Cut Sawyer’s one-liner about putting pants on. - Cut Hurley and Jack finding Shannon’s inhaler and the caves where they lived before where Hurley speculates about the two bodies, since we already got that answer in part 1. Also, cut Jack reminding us about his father’s empty coffin. - Cut Jacob’s Ladders scene of Sawyer and Locke climbing down the ladders and Sawyer almost falling. Seemed silly since obviously a main character is not going to be killed by falling from a ladder. - Cut Jack’s line after kicking open the door to the lighthouse. - Completely cut all of the scenes where Claire interrogates Justin (the “other”). In my edit, he just died when she shot him at the end of the last part, instead of him playing dead. No more axe-murderer Claire! - I did leave in Claire talking with Jin and stitching up his leg in the hut, but I cropped “Justin the Other” out of all the shots. - Cut out Richard trying to loosen his chains and encountering a wild boar during one of his flashbacks. - Cut Kate and Sayid meeting in the jungle and Kate talking to Miles. We already know that she is going back to the temple to ask the others about Claire, so this is all just unnecessary. - Cut Flocke asking, “Now what’d ya go and do that for?” after Sayid stabs him. Much more tense this way. - Cut some dialogue from the end of the campfire scene that originally set up for the “Ab Aeterno” episode. - Moved the Whidmore submarine reveal to the end of this part to set up for Part 3. - Cut shot of periscope viewing the people on the beach. I had to do this since it is a shot of the reunion scene from the end of Dr. Linus and it clearly shows Richard and Hurley on the beach, even though they don’t get back til well into the next part. The operator saying, “Sir, there are people on the beach” should be a enough. - Removed all the spots where it goes to black for the commercials. - Added credits at the beginning due to the removal of the “flash-sideways” scenes. - Cut scene of Sawyer pulling the gun on Flocke. Seems like Sawyer would be too smart for that. - Cut Hurley and Miles playing tic-tac-toe. - Cut episode opening for Dr. Linus of Ben running through the woods alone. - Cut everything of Alana’s group chatting on the beach when they get back there. Too much redundant exposition. - Cut Hurley dreaming about cheese curds. - Cut Sawyer preparing the tea for Jin and burning himself. - Cut Alana’s flashbacks completely and reedited the campfire scene so Richard doesn’t suggest they are all dead and in hell. - Split up one of Richard’s flashbacks so it wasn’t so long. - Added “FanEdit.org Presents” and “A Fan Edit By DriggyDriggs” to after the recap. -Opening scene is a slightly edited version of the scene at the end of “The Last Recruit” where some are captured by Widmore and Locke and Jack are bombed. - Blended some scenes of the beach group from “The Package” with “Recon” in order for the episode to flow better. - Cut Sawyer finding the dress Kate wore in Season 3 when they were locked in the cages. He’s moved on from Kate, there’s no need for this. - Cut scene of Flocke telling Kate about his crazy mother and comparing her to Claire. - Cut Widmore’s people watching the camp through night vision goggles. Makes it much more surprising when they all get tranq-darted. - Cut a scene of Flocke talking to Jin about the names on the cave wall with Claire listening in. - Cut out the entire subplot (several scenes) about Sun forgetting English after she bumps her head. I wish I could have cut her bumping her head entirely, but it just didn’t work out, because she suddenly has a giant bruise on her head. Now she just has a slight concussion. This part of the editing was pretty challenging at times. The one drawback is that Sun is pretty quiet for a while, but that’s not so bad, as I’d rather her have nothing to do at all than what we got on TV. - Cut out Alana questioning Ben about Sun’s bump to the head. - Cut Claire asking Flocke about the names in the cave and asking him if he really needs her. Mostly for flow, and the scene just isn’t necessary. - Cut Jack telling Richard that he promised Sun he’d get her off the island, since I cut that scene too. - Cut out what Desmond sees in his flash from “Happily Ever After.” Now, he gets blasted, and they come in and find him lying on the floor asking how long he was out. We don’t find out what he saw until part 4. - Cut Hurley talking to Libby at her grave and Alana interrupting him. - Cut Miles talking to Hurley about dead people yelling at him. Since Miles doesn’t go with them, it doesn’t matter. We already know Hurley talks to the dead. - Cut the scene of Flocke asking Desmond how long he was down in the hatch and them seeing Kenton Duty (young Jacob). Mostly for pacing, but also because for a reason unknown, Kenton’s hair is brown instead of blond in this scene. - Cut out the “explanation” for the whispers. Now, Michael just helps Hurley find Flocke’s camp, he doesn’t explain ghosts to Hurley. - Added the beginning scene from “What They Died For” of Jack sewing up Kate’s gunshot wound. This is the final scene. - Added some music here and there, and cut a few other lines of dialogue. - Added credits for guest stars, writers, and directors for all episodes. - Removed Kenton Duty’s name from the opening credits, since I had deleted his scene before and I forgot to remove it in version 1. 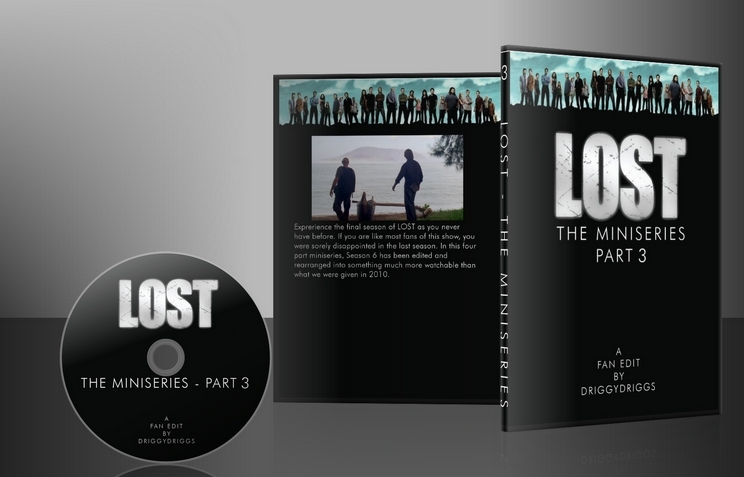 In the final part of this Season 6 fan-edit, Desmond’s purpose for returning to the Island is revealed, as Jack, Kate, Hurley, and Sawyer must find him to help them stop the Man in Black. One of them will become the Island’s new protector in place of Jacob. The episodes used were "Happily Ever After," "What They Died For" and "The End". - “Previously on LOST…” This recap is a little longer than the others, being the finale. - Added “FanEdit.org Presents” and “A Fan Edit By DriggyDriggs” after the recap. - Opening scene is Jack, Kate, Hurley, and Sawyer standing on the beach looking over the water. This made a perfect opening. They say they need to go find Desmond, then we flashback to a few nights earlier and see Desmond get blasted with electromagnetism by Widmore’s people. Throughout this part, we reveal through flashbacks what happened to him. The last flashback is right as he is being lowered into the cave. In my edit, he actually went to an alternate universe. - Cut Ben, Richard, and Miles walking through the woods and chit-chatting. - Cut the next scene of Miles walking over the spot where Alex died. - Cut them walking into Ben’s house and chit-chatting some more. - Several small cuts were made throughout to improve the pacing of the on-Island events leading up to the stand off between Jack and Flocke. - Cut all shots of Desmond being conscious after he “pulls the plug.” In my edit, when he is exposed to the light, his consciousness actually goes back to the alternate universe. - Completely changed the ending. Since there is no more afterlife ending, I had to completely rework Jack’s death. Now, as he is dying, his life on the Island flashes before his eyes. - I chose not to go with the purist ending of Jack closing his eye, and that’s it. That just won’t work with my ending. Instead, once Jack closes his eyes, it fades to white, then we get a nice LOST style WTF ending. You’ll see what I mean. - Keep watching through the credits for a bonus scene. I added a portion of the “New Man in Charge” special feature. I chose not to include Ben shutting down the Dharma station. Now, after the credits, he goes to see Walt in the main timeline. - Added some music and sound fx to quite a few places. - (DVD ONLY) Redid my portion of the audio commentary track so that when I am not speaking, the audio for the edit is turned up. 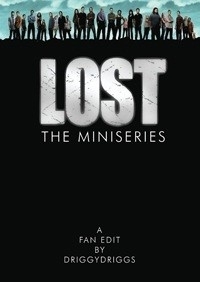 I wanted to say I'm a pretty big huge Lost fan and I really enjoyed this edit. When the show was on TV a decade ago (man has it been that long?) I looked forward to each week's episode especially during the final season with great fervor. That being said after the emotional but lame cop out of an ending that didn't really provide any answers my affection for Lost went down a peg or two. So without watching my discs for years now I watched this edit with an open mind. I was completely satisfied with this edit. It blended together seamlessly and told a story. I was a little off put on the 3rd part because it starts off with characters in a place they weren't at the end of two, but then in true lost fashion it shows how they got there "3 days ago..." so ultimately it worked well. One thing - if it was me, I would add the complete segment from "the new man in charge" season 6 bonus feature because as the Dharma dude says in the clip 'we want answers'. After 6 seasons we deserve them! The 'new man in charge' section adds some answers to bits from earlier seasons (for example season 1 question: 'hey why's there a polar bear?') but I understand the decision to streamline it for storytelling reasons as it wasn't part of the story of the miniseries. 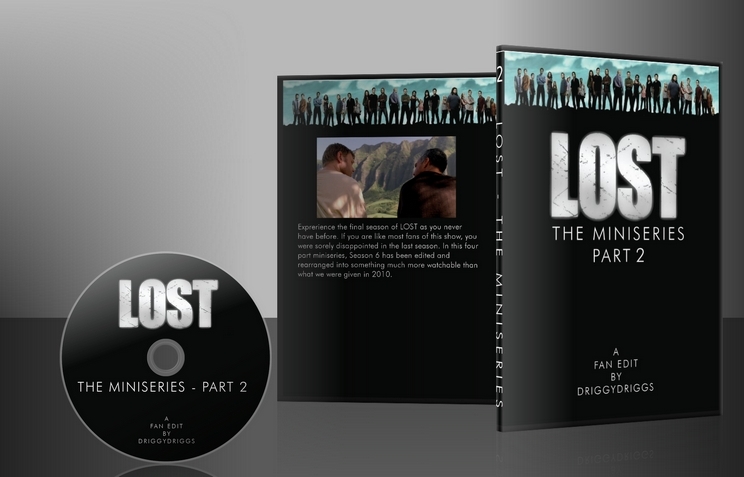 Anyway, if you are new to Lost or like me a big fan then you will enjoy this edit. Thank you DriggyDriggs for this edit. Highly recommended. This is it people. LOST has a proper THE END. Driggs' edit is perfect in every way. Editing is top notch. Quality is perfect (to my eyes and ears). And above all else, the story changes (especially in Part 4) are PHENOMENAL. In my mind, this is how LOST ended. If you were disappointed with Season 6 of LOST, see this. If you consider yourself a diehard LOSTie, see this 3 or 4 times. (And listen to the commentary on Part 4).